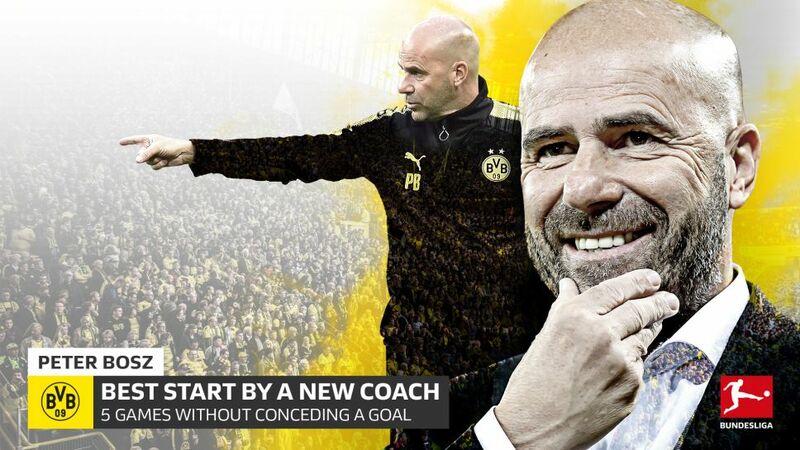 Borussia Dortmund supremo Peter Bosz made Bundesliga history on Wednesday night by becoming the first coach ever to keep consecutive clean sheets in his first five games in Germany's top flight. The 53-year-old Dutchman, recruited from Ajax as Thomas Tuchel's replacement over the summer, has overseen a superb start to the domestic campaign with four wins and a draw from five games to take BVB top of the Bundesliga table. Dortmund cruised past Hamburg to record a 3-0 win on Matchday 5 on what was a night of records for the club, with Christian Pulisic scoring BVB’s 3,000th Bundesliga goal. Furthermore, Dortmund are averaging almost three goals per game, with 13 scored so far in victories over Wolfsburg, Hertha Berlin, Cologne and Hamburg, in addition to a goalless draw with Freiburg. Next up for the Dutchman and his team is the task of welcoming Borussia Mönchengladbach to the Signal Iduna Park on Saturday evening (kick off at 18:30/16:30 CEST).